. . . . . . . . . . . . . . . .is the reason why. . . . . . . . . . . . . . . . you are alive. . . . . . . . . . . . . . . . . to learn about life?
. . . . . . . . . . . . . . . .. . . . . . . . . . . . . . . . . . . . . . . . . . . . . . . . . .. . . . . . . . . . . . . . . . . . . . . . . . . . . . . . .. . . . . . . . . . . . . . . . Seeing, searching, questioning, wondering, imagining, experimenting, risking, observing, noticing and showing are fundamental to my passion - effective engagement with people through image making. All my professional life, I've been an interactive painter ( artist / designer / social - entrepreneur), embracing change with a visioning process for 'seeing ideas', acting on possible societal solutions and sharing through painterly diagramming (visionbuilding). This website organises ArtLife into associations of one /, between two /, or (three or more), using the 3 spiral pattern. It is arranged in scale from the personal to global in 3 tabs above ^ I / THE / WE leading to.. Individual artworks. / . THE art service exchange . / . and the activities WE may undertake in visioning. Social Aspiration: to systemically share visualisation abilities as an engineer would, rather than as an artist might, . . . . . . . . . . . . . . . . . . . in seeking observable “living” outcomes - with an emphasis on quality. Corporate Passion: to pioneer, consult and craft innovative responses to competitive conditions using a nonverbally inclusive, creativity delivery system [problem-solving & transformation tools] that makes sense of patterns of observation by . . . utilising the "painting" of rich-picture (stimulating) learning environments. Thankyou for making the "Much" Exhibition opening by the Hon David Lloyd QC - truly engaging. 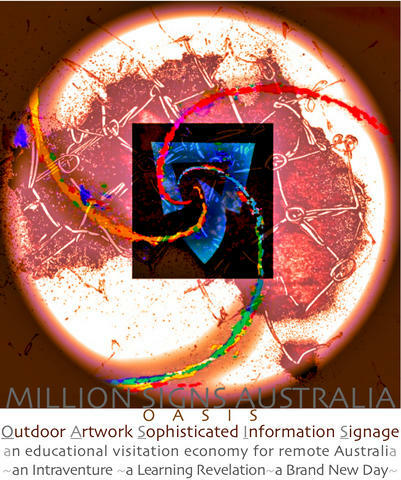 It was a valuable opportunity to introduce the visionbuilder project - " Million Signs Australia", and, share the background artwork and thought, that forms this national scale, participative adventure. The Art of VISIONBUILDING is a new paradigm in societal behavioral transformation. . . It systematically helps to picture what is possible at a time in history when a renewed sense of optimism and trust is vital. It is based on a 3 SPIRAL PATTERN approach. . that may be seen as . . a more complete and dynamic management of sustainable systems than an image of gridlocked fundamentals on a triple bottom line. Vision building enables one to become more observationally aware and further engaged via a novel, multi-language, commonsense process for ‘thinking outside the square’ ie is culture just a blastoid state? These tools can ease the trauma of transition and enrich the way we look, think, and behave, in relation to immutable change. . . . . . . . . . . . . . . . . . . . . . . . . . . . . . . . . . . . .from now on, we will have to adjust differently. VISIONBUILDING helps business, government and community deal with necessary change, in an increasingly competitive world, by harnessing the potency of cooperation and alliance formation. feedback & information exchange . . . . . . . . . . . . . . . . . . . . . . . .contact . .